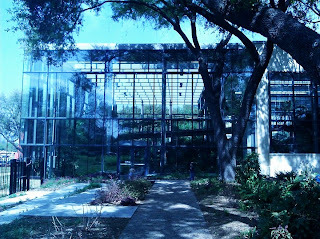 This week the boys and I checked out the Texas Discovery Gardens, at Fair Park. We've passed by it a million times at the State Fair of Texas, going to and from the Museum of Nature and Science, and the Children's Aquarium. 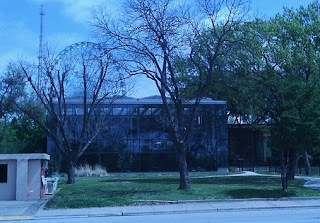 Really, if someone had bionic kids, they could do a lot in one day at Fair Park. Mine, however, can only handle one event per day. Admission was $8 for me, $4 for William. They didn't have me pay for Aldous. I have no idea if there is a discount with a membership anywhere: I forgot to ask. 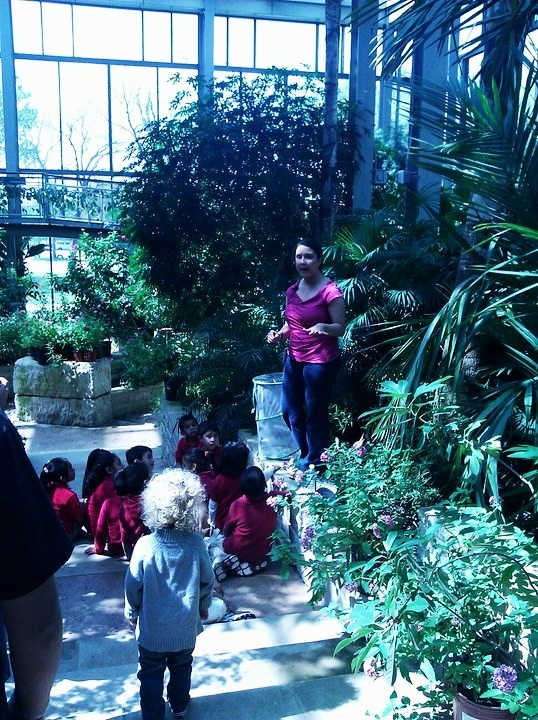 Mainly, we went there to see their butterfly exhibit. It's been cool lately and I've been looking for something newish to do where it was warm and this fit the bill! 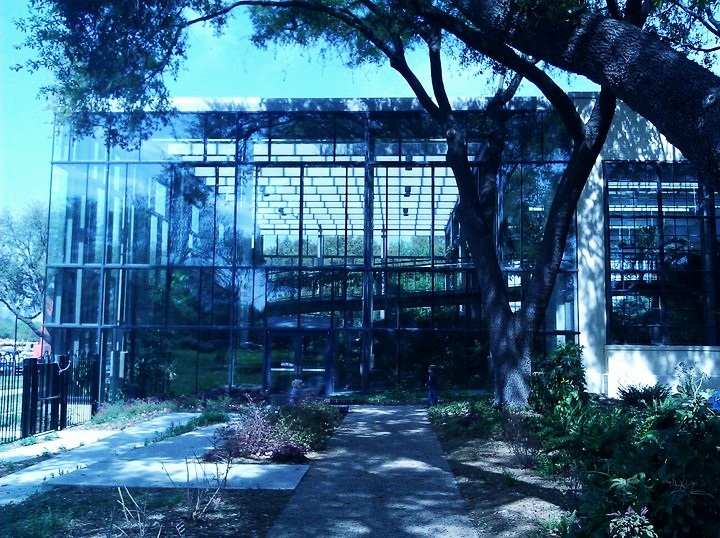 The butterfly house is a huge glassed in building and is nice and warm! To William's delight, we got an identification sheet for butterflies we might see in the exhibit! Woohoo! In case you don't know, I actually dislike butterflies and moths quite intensely. I find all of their spindly, tickly legs very repulsive. Nonetheless, I soldiered on. I have very few pics of actual butterflies because they fly very fast. I did my best. What's cool about this is that you start at the top! and walk slowly down a winding walk that circles a lovely garden. It's a beautiful view! This was on a window ledge far below me. William had a grand time matching it up with his identification sheet. Some pretty plants. There are really tons of butterflies in here, but I wasn't lucky enough to catch many of them in pictures. This was sort of neat: they had a box where all of the cocoons were all lined up, at different stages. So the ones int he back were just hatching. This is the butterfly food. The boys thought this was the yuckiest thing they'd seen! I love this weird fern!! I had a billion of these blurry butterfly pics, but I refrained from sharing them. Except of course, this one. This thing is freaking huge. 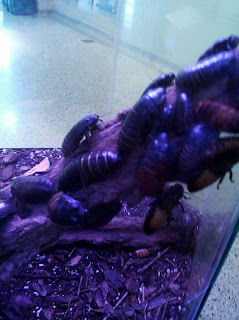 One of these mo-fos landed on my arm and I would have taken a pic but I was too busy freaking out. Gross. another window ledge full of butterflies! See that cool black one with white dots on the far right? More pretty orchids. I really like orchids. Significantly more than I like butterflies. We exhausted our interest in the butterflies and went back upstairs to get our stroller, then BACK down to go outside, to the gardens. 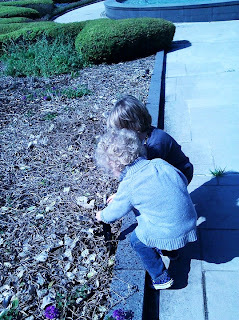 The first thing the boys noticed in the garden was this drain. The grass is so beautifully green! Aldous tried it, too, but couldn't hang. WHOA!! this fountain is exciting!!! A gigantic sphere. There were two of these. Aldous poking his way along to the other side of the fountain. this view was so lovely, I thought. What time is it? it's time for LUNCH!!! We found this lovely picnic table under a shady trellis. The vine had these flowers that smelled just like cappuccino! This has got to be the fanciest toilet paper dispenser I've ever seen. Next up, the tequila plant! rows and rows of plants. I love this idea. The tomatoes are planted closest to the trellis on the outside. All the shady stuff is UNDER the trellis (spinach). Chard was outside of the tomatoes. Peas just starting up the trellis. I used to LOVE growing peas, but I don't have the room here. A pretty pond, that the boys threw stuff into. We do not pass a body of water without something being thrown into it. A beautiful breezeway with more of the cappuccino vines. And, a picture on the bench. Neither of them looking at me. a rose garden!! it smelled lovely in here! a very tiny white rose. No kidding, this thing was an inch long. I don't know what this is, but it's cool. After that, we headed back in. William wanted to do a quick walk thru of the butterflies again. This woman was talking about the butterflies to school children but it was too slow for William. We moved on. Out in the lobby, before leaving, we checked out a few bug displays. This was the most delightful. Almost as gross as the butterflies: ALMOST!! OMG those toilet paper dispensers! Ingenious. Mo-Fo's Jacki? Giggle, giggle, You are so FUNNY! I love the posts you do with your boys. Ha! Sprinkler exibit? I liked that too. where I work, the scalehouse got a brand new trailer. And they didn't have a papertowel holder. Seems nobody knows where to find one. 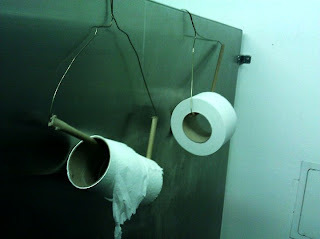 So I made one of those super fancy toilet roll holders & fashioned a papertowel holder that hangs off the stationary towel rack.